What are the main game’s features of the upcoming opponent ? There are players you should pay attention to ? What are the strategies used on set-pieces ? There were mistakes in the movements of individual players or specific roles ? In a specific situation, the defensive line has performed the movement which had been tested in training? The pressing that you requested has been only sporadic or constant during the various phases of the game? The easiest way to explain a sporting gesture is to show to the protagonist how he has performed it. 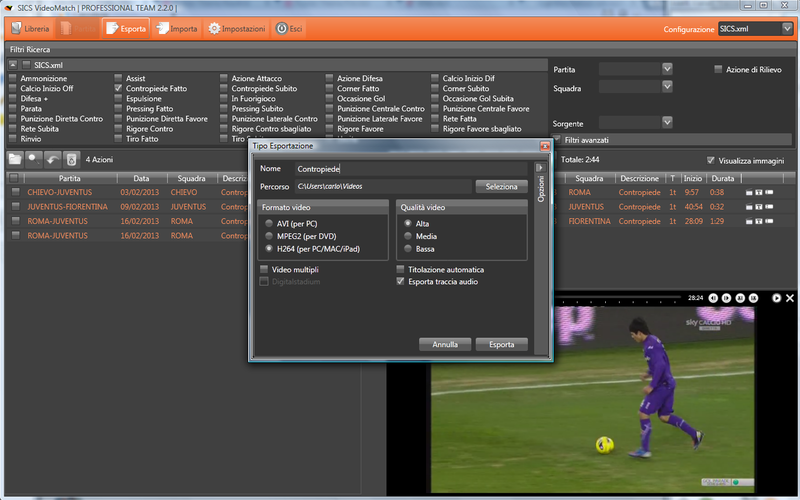 It can be used in a classical way with a video projector or connect the computer to the TV, in which case will be simply export the video from VideoMatch in a compatible format with the TV. Or you can upload the video directly from VideoMatch on cloud (Es.Dropbox or Google Drive) and display it on PC, Mac, and on all mobile devices. This will make possible to prepare videos for a specific department (eg. defense, midfield) or for a single player in which you exhibit the characteristics of the the opposing players.